The benefits of flaxseed oil are such that they put it in the Super Food category. It has been called “sunshine in a bottle” because biochemically it provides energy for the body much as the sun does. Did you know it could be eaten to help you with weight loss and even obesity? The flax plant is one of the oldest known cultivated plants; references to the healing power of flax are found in Greek and Roman writings dating from 650 BC. It has traditionally been grown for it’s fiber which is woven into linen and for it’s seeds which provide oil and meal for food. The benefits of flaxseed oil make it one of the healing fats or EFAs (essential fatty acids.) There are 2 of these, linoleic acid (LA) and alpha linolenic acid or LNA. Flaxseed is the richest source of alpha-linolenic acid and contains over 50% of it’s fatty acids as LNA. Biologically we need certain essential nutrients to live: vitamins, minerals, amino acids, and essential fatty acids. There are many food sources for essential fatty acids. These are called the omega 3 sources and in addition to flaxseed they include avocado, fish and fish oils, raw nuts especially walnuts, seeds including sunflower, sesame, chia, flax, hemp oils, sunflower, sesame, walnut oil, and canola oil. 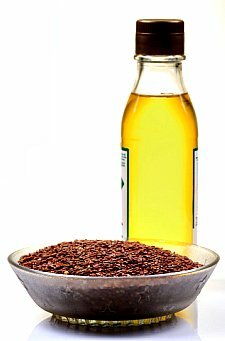 If you haven’t been getting enough of these good fats in your diet a good flaxseed oil that is properly packaged is the richest supplementation. It is the most delicate food oil of all and deteriorates rapidly when exposed to light, oxygen or heat. * Follow the directions on the bottle or consult with a naturopathic physician. Flaxseed oil is a beneficial natural treatment for degenerative diseases such as cardiovascular disease, cancer, diabetes and allergies. Flaxseed oil is useful in infant nutrition. Flaxseed oil will improve athletic performance. Flaxseed oil has been used to keep pets healthy. Flaxseed oil can prevent and treat constipation. Flaxseed oil is good for digestion. If you are not deficient in the omega 3s, you can eat freshly ground seeds! A tablespoon of flaxseed meal is the equivalent of 1 teaspoon of flaxseed oil. Flaxseed meal is a wonderful food to eat every day on your cereal or in your smoothie. It is one way to be sure you are getting your essential fatty acids every day. Keep it in the refrigerator as it is highly perishable. This is where the benefits of flaxseed oil become so interesting because we have been indoctrinated to believe that we shouldn’t eat fats if we need to lose fat. And it’s true that we should cut way back on animal fats for good weight management. To be healthy we should eat absolutely NO trans fats or hydrogenated fats which have been called the “killer fats.” Read labels to know whether a processed food has trans fats or hydrogenated fats. These have been exposed to light, heat and oxidation. The plant fats and fish fats are the essential fatty acids and are in a different category altogether. These are the fats that heal and burn fat. Flaxseed oil can make fats burn more rapidly. EFAs help the kidneys release water. Essential fatty acids can increase metabolic rate, oxidation rate and energy production. Flaxseed oil will help to stabilize your blood sugar. At least 25 - 30% of what you eat each day should be some good fat which can be of course in the food you are eating. It sounds paradoxical but it’s true. It's not whether you should eat fats, the question is what kind of fats. The omega 3 sources (especially flaxseed oil) are the foods that burn belly fat, the most difficult of the adipose tissue to release. To get the benefits of flaxseed oil you to be eating in a balanced, sensible, low glycemic way and exercising daily. Udo Erasmus, PhD is an internationally recognized authority on the subject of essential fatty acids. He notes that when you diet your metabolism slows down because you are restricting calories. He goes on to say that there is some evidence that gross overeating only occurs in about 10% of obesity cases. The other 90% are lacking exercise and choosing foods that are lacking essential nutrients. This is the fundamental premise for this website. Losing fat permanently is about restoring your health! You need basic vitamins and minerals to support the transport of fatty acids into your cells and for optimum metabolism. You need to eat lots of fruits and vegetables, whole grains and good quality protein along with the EFAs. This will ensure that you are getting fiber as well as the nutrients. If you are using flaxseed oil therapeutically it is advised to take a food form vitamin and mineral supplement to be sure you are getting what you need. If your bmi is higher than 30 talk to your doctor about the benefits of flaxseed oil for your weight loss program. You need to be able to get daily exercise and be eating a balanced low glycemic diet. You need to overwhelm your body with the fruits and vegetables and some lean protein. You could do this by juicing greens and eating 5 - 8 servings of vegetables and fruit a day. If you are deficient in EFAs there could be wonderful benefits of flaxseed oil when added to your diet. In his book, Fats That Heal, Fats That Kill, Udo Erasmus tells the story of a woman in California who lost 80 pounds of excess fat by adding 3 tablespoons of fresh flaxseed oil to her dietary program. She was already eating a nutritious diet but was apparently deficient in the essential fatty acids. The addition of the flaxseed oil allowed her to finally burn the excess fat. When you get the nutrients you are deficient your body is supported in it's healing efforts. If you decide to add flaxseed oil to your fat loss program because you haven't been getting enough EFAs, take a vitamin/mineral to support your metabolism. Plan to eat the extra flaxseed oil for just 6 months because it is so rich in LNA that long term it could throw off your balance of omega 3s to omega 6s. Follow the dietary guidelines outlined here, eat the low glycemic carbohydrates and be sure to exercise every day. The benefits of flaxseed oil can be profound. It can improve digestion, prevent and reverse constipation, stabilize blood glucose levels, improve cardiovascular health and inhibit tumor formation. If you have been overweight for a long time and eating lots of high glycemic carbohydrates (white foods and starches) and few EFAs then this may be something you want to consider. * If you are obese (bmi above 30) consult with a doctor before starting any type of therapeutic program. There are many medical complications associated with obesity. This website is not a substitute for medical care for any disease. Most people who are overweight are very acidic and need to eat far more alkaline producing foods! You will not have to worry about ending up with cancer or getting fat if you eat these powerful super foods. Each of these is a powerhouse of nutrition and will help you be skinny for life. The truth is this is the only way you can get enough alkaline foods. Return from Benefits of Flaxseed Oil to Definition of Obesity. Return from Benefits of Flaxseed Oil to Lifetime Fat Loss home page.